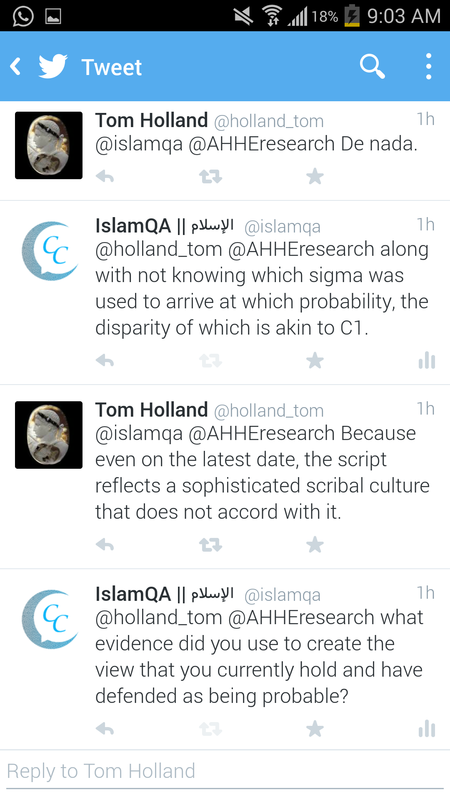 Most people are aware that Tom Holland is a historian, most people are also aware that he is not a palaeographer, nor a papyrologist, nor has he studied Arabic codicology. 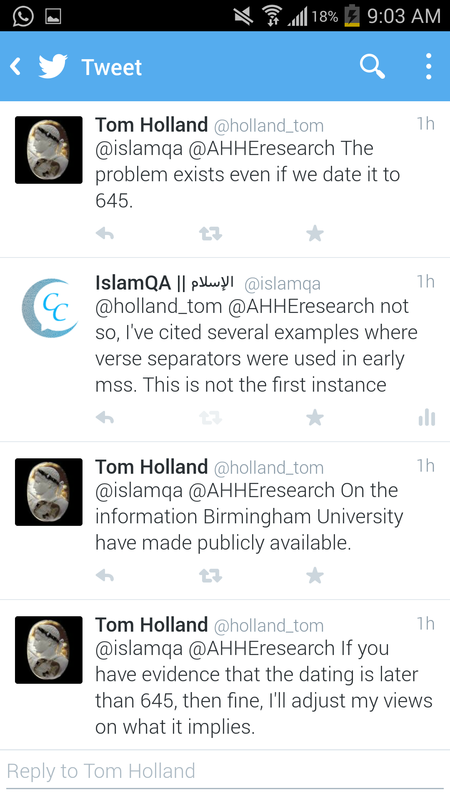 Therefore, finding him being referenced as an academic source regarding the Birmingham manuscripts was extremely strange. 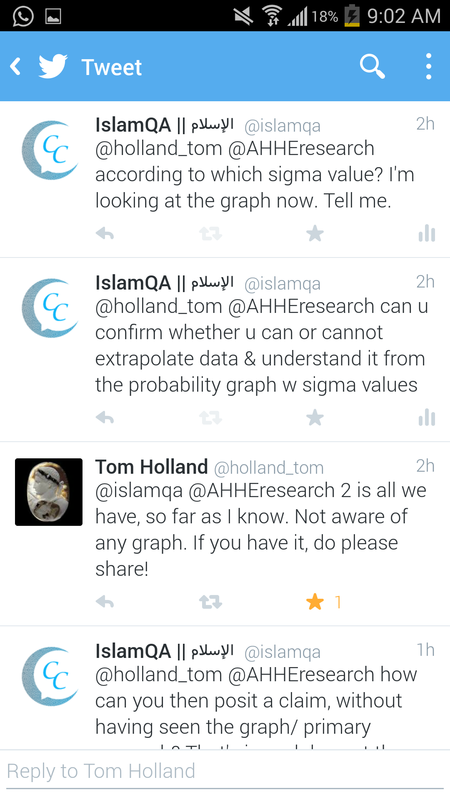 I decided to tweet Tom and get some answers. 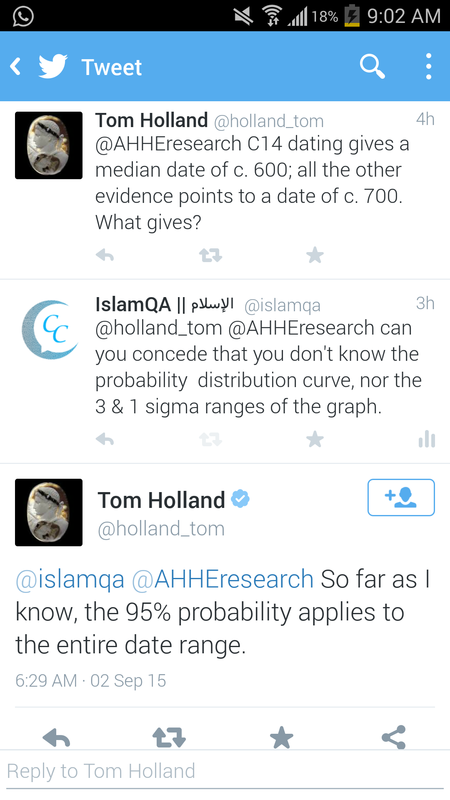 Have you seen the probability distribution curve with any of the sigma ranges? His answer was no, he was not aware of any graph. This is strange because you can only know how the date ranges work if you’ve seen the graph, if you haven’t, then where did he get his “analysis” from? 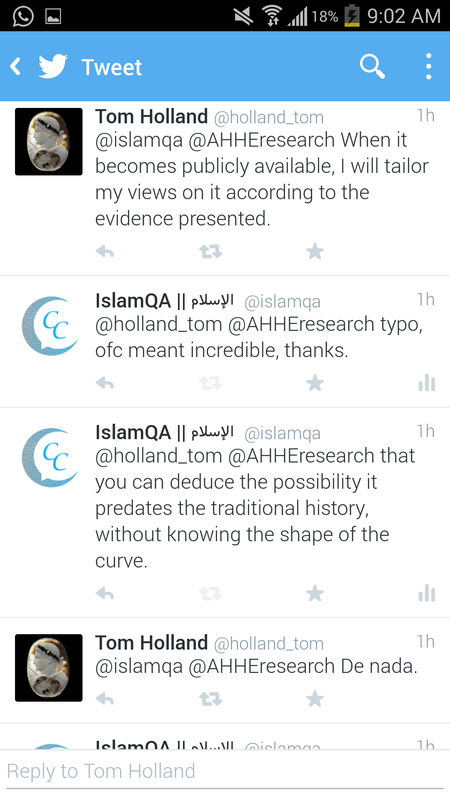 I asked, if he didn’t see the curve, how was he able to give an analysis. His answer was, “(based) on the information Birmingham University have publicly made available”. The problem here is that the only information regarding the dating that they have made publicly available is merely mentioning the date range, no scientific data regarding the analysis of the C14 was made public. In other words, he had no sources and did not consult any scientific data to arrive at his conclusion. I immediately pointed this out to him. 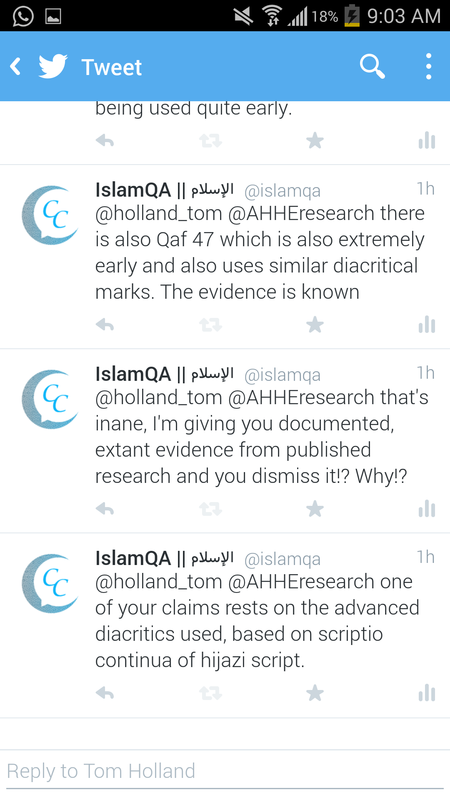 I then asked, if not based on actual C14 data, what did he base his analysis on? He proceeded to state, “even on the latest date, the script reflects a sophisticated scribal culture that does not accord with it”. To which I replied that we do have early manuscripts with diacritical markings. He asked me for evidence of this, and so I gave him one citation and before I could proceed, he chose to end the conversation at that point in time. So what have we learned? 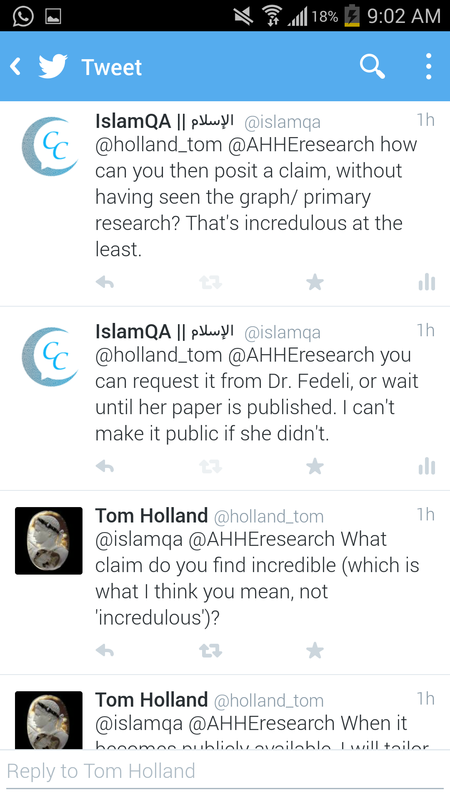 Tom Holland is not a specialist in this field. He did not consult any actual data to arrive at his publicly claimed conclusions. 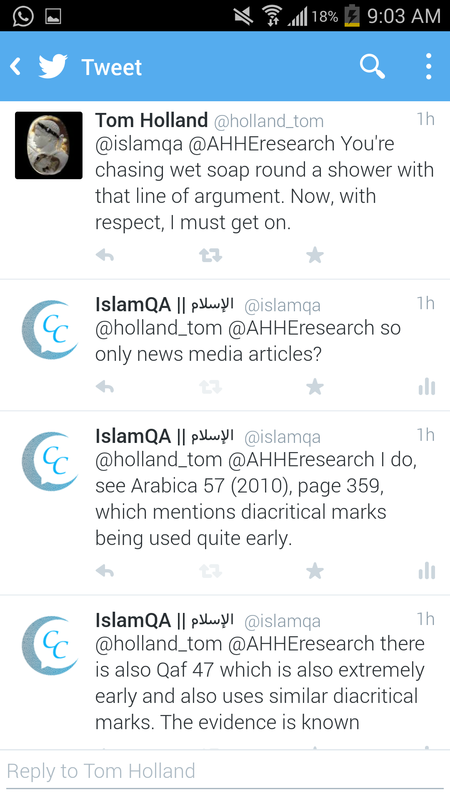 He is not aware of how manuscripts are carbon dated, nor is he aware of modern studies on Arabic palaeography and codicology. In other words, his opinion is akin to asking any random person off of the street to give their analysis of highly specialized scientific data. Tom Holland, the author of “In the Shadow of the Sword,” which charts the origins of Islam, said the discovery in Birmingham bolstered scholarly conclusions that the Quran attained something close to its final form during Muhammad’s lifetime. He said the fragments did not resolve the controversial questions of where, why and how the manuscript was compiled, or how its various suras, or chapters, came to be combined in a single volume. – NYT. You can read the full conversation on Twitter, here. As we say in cricket, Tom, learn to bat in your own crease. Actually I would question this. Can anyone tell me what his academic qualifications are to be an historian? Yes indeed these are good questions. We need to check the tutor before we are going to take a tution.